While many wildfires cause little damage to the land and pose few threats to fish, wildlife and people downstream, some fires create situations that require special efforts to prevent further catastrophic damage after the fire. Loss of vegetation exposes soil to erosion; runoff may increase and cause flash flooding; sediments may move downstream and damage houses or fill reservoirs; and put endangered species and community water supplies may be at risk. The BAER program addresses these situations with the goal of protecting life, property, water quality, and deteriorated ecosystems from further damage after the fire is out. Concern for possible post-fire effects on fish, wildlife, archeological sites and endangered species is often a primary consideration in the development of a BAER plan. 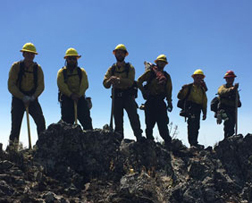 FireFit provides the interagency wildland fire community with a comprehensive, easy-to-follow, fitness program with the ultimate goal of improving firefighter safety and health and reducing injuries. This program provides a basic format for a well balanced fitness program that can be augmented as local units see fit. The National Incident Management Organization is composed of seven member incident management teams with complex fire management as the primary focus of their positions. In addition, these teams have year-round "non-incident" duties in support of Fire and Aviation Management. These responsibilities include: training, quality assurance activities, fuels management, fuels implementation, fire and resource management support, NWCG projects, cost containment, and leadership development. Fire managers must understand the complexity of smoke management. Protecting lives and resources are always a top priority, but managers must also understand the legal and operational aspects of smoke management.